I just posted a review of Darina Allen’s newest cookbook: Simply Delicious, The Classic Collection. New book. Old, and classic, recipes. Recipes you do not want to miss. Thirty years ago, when she began her Simply Delicious series on Irish television, she also began publishing small Simply Delicious volumes. The new book is the best of the best from those early years. And this wonderful soup is the first recipe in the book. It shows how this volume has a sprinter’s start. The next 99 recipes will not let you down a single step. Not a celery fan? You will be. Using a vegetable peeler, remove the strings from the outside stalks of the celery and reserve to use in stock. In a heavy-bottom saucepan, melt the butter. When it foams, add the potatoes, onions, and celery, and toss in the butter until evenly coated. Season with salt and freshly ground pepper. Cover with a wax paper lid (to keep in the steam) and the pan lid and sweat over gentle heat until the vegetables are soft but not colored, about 10 minutes. Add the chicken stock and simmer until the celery is fully cooked, 10 to 12 minutes. Using a blender or food processor, blend the soup until smooth, adding the creamy milk to taste and thin to the required consistency. Season to taste. Serve the soup piping hot with a spoonful of whipped cream on top. 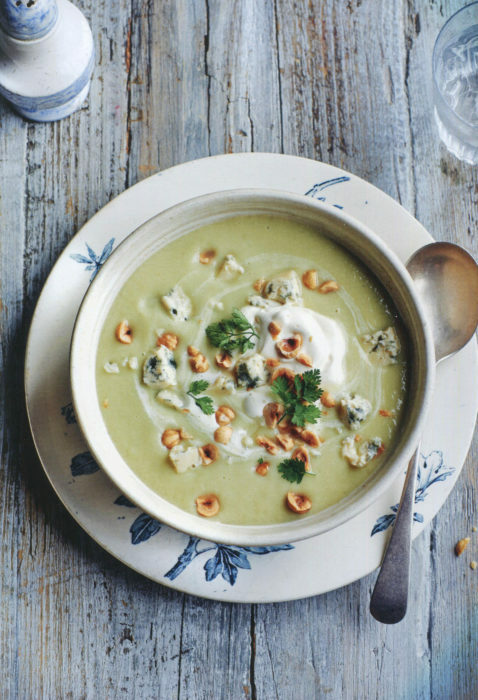 Sprinkle with the crumbled blue cheese, coarsely chopped hazelnuts, and chervil or flat-leaf parsley sprigs.